This magnificent, Spanish colonial style settee has a tall, solid wood seatback, adorned with colonial, curved lines and exquisite, hand carved, floral designs. The seat is well padded and it is upholstered with gorgeous, patterned, full grain leather, and the leather is hand tacked to the frame with beautiful, gilt nails. On each side of the seat is a dramatic, curved armrest, ending in a scroll design with gilt nail details. 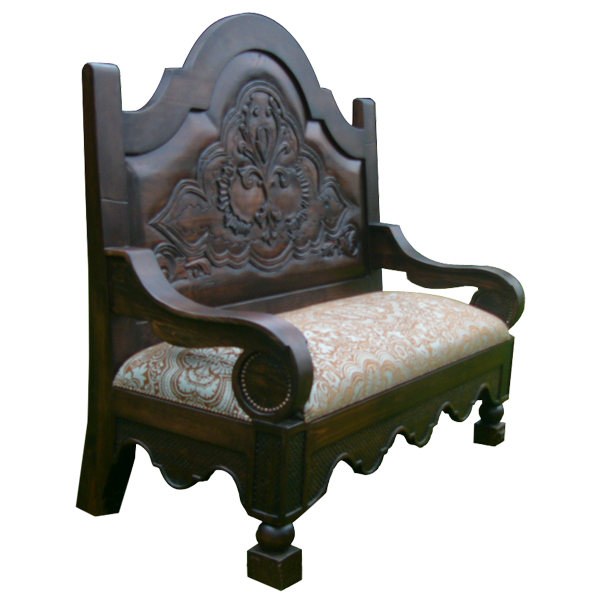 The seat rest on a solid wood base, and the base is adorned with a Spanish colonial style, curved design with hand carved details. The bench is supported in the front with hand turned legs with rectangular cut feet, and in the back with slightly curved, square cut legs. It has an opulent, dark finish, and it is made with the best, sustainable, solid wood available. It is 100% customizable.